New American Charcuterie Gift Box for sale. Buy online at Zingerman's Mail Order. Gourmet Gifts. Food Gifts. 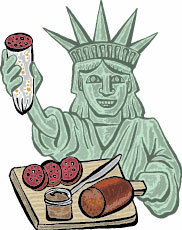 There’s been an explosion of great charcuterie in America over the last half decade. Roughly corresponding to the rise in whole animal butchery—a process that creates a lot of “extra” cuts available for charcuterie—I’ve seen more new salami and pates in the last five years than I had in the fifteen before that. Many get an A for effort, but the flavor is marred by too much salt or spice. A more frequent sin is size: little salamis dry out quickly; one day they’re good, the next day they’re as hard as a nickel. We’ve tested and tasted hundreds of them over the last few years and this small collection represents some of the best. For a cured meat connoisseur, there’s not much better. All the meat is sourced from animals raised on land with room to roam with diets that don’t include antibiotics or hormones. Gift box includes ‘Nduja Calabrian spiced meat spread from Chicago’s ‘Nduja Artisans, Pork Rillettes from the Ithaca’s The Piggery, Summer Sausage from Madison’s Underground Meats, and Vecchio Salami from Minneapolis’s Red Table Meats.